Because of In Liquid Color I have just panic bought 5 tubes of Quinacridone Gold (PO 49). 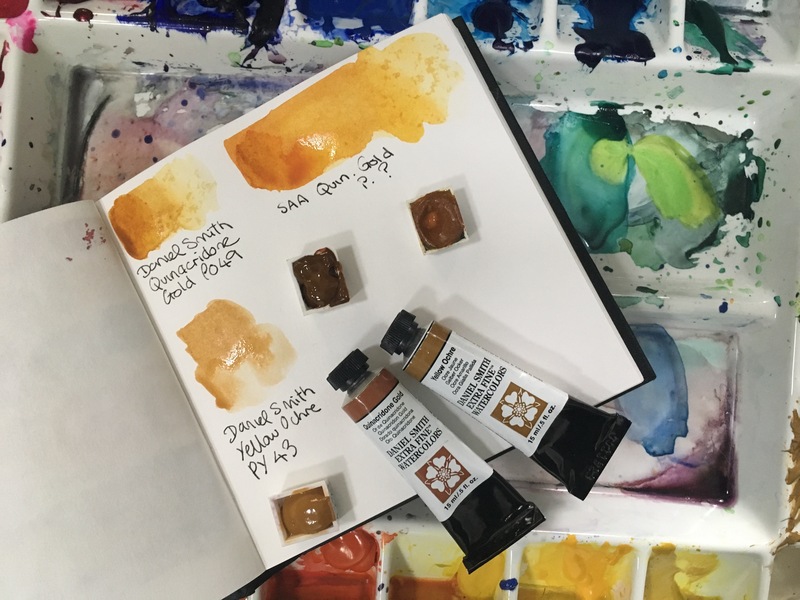 According to In Liquid Color, Daniel Smith bought up all the PO 49 when the pigment went out of production. (People dont want quidacridone gold cars any more) and they’ve just announced their last batch. I previously had the SAA’s Quinacridone Gold (no pigment number details on the tube) and i think it’s old enough that it might be the ‘genuine’ pigment. As you can see from the swatch comparison, the SAA is more garish. I also bought a tube of Daniel Smiths Yellow Ochre. Since I learnt how to colour mix in my 20s I’ve been one of those painters who likes a limited palette, doesn’t use black and turned my back on yellow ochre and using Indian yellow and raw sienna. Because of In Liquid Colour and Sadie Saves the Days’ Yellow Ochre Spot Light video, I have decided to give the Daniel Smiths mix a shot. 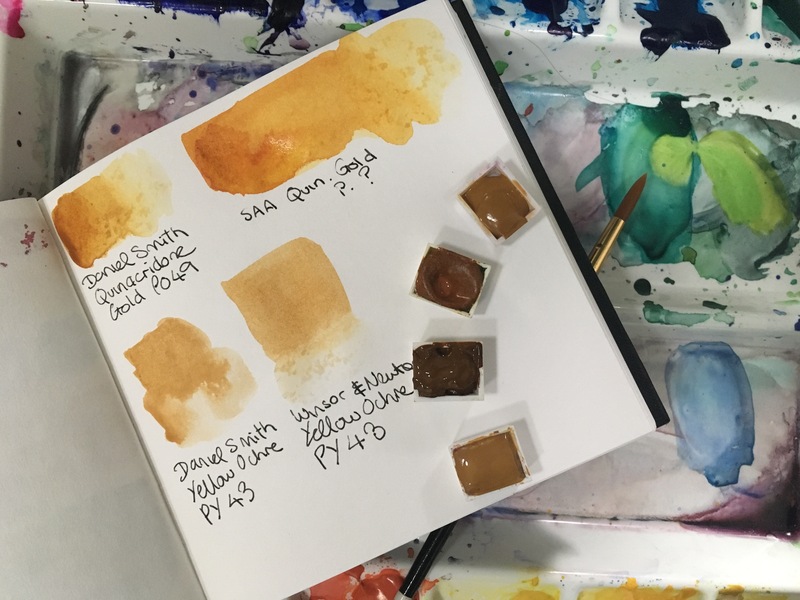 From first swatch the Daniel Smith looks much more earth toned, and the Winsor and Newton looks lighter (it is from a pan set I bought, I take the yellow ochre, the black and the white straight out.) I used my sketchbook to colour swatch in and it isn’t taking a watercolour wash well. 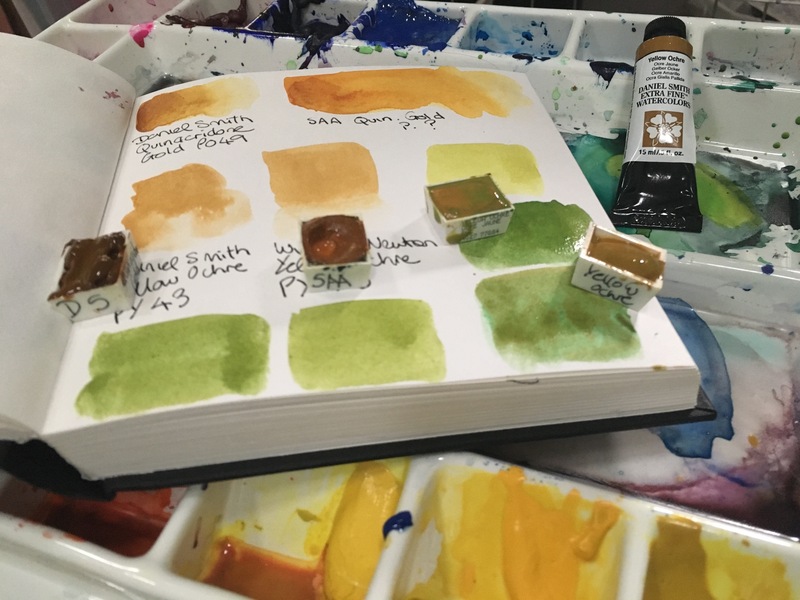 Daniel Smith Yellow Ochre is transparent and granulating, compared to the Winsor and Newton which is Semi Opaque and as from my lumpy swatches, doesn’t seem to granulate. When I used to rely on it to make my sap green more realistic, it used to deaden the colours. Uncharitable souls might comment that this is what the English landscape looks like anyway… But does anyone else look at their old work and just see an overuse of one colour that deadens the over all tone of the piece? So here they all are mixed with Winsor Green Yellow shade. In conclusion, i am going to have to do this again, but on better paper. I can see the Daniel Smiths yellow ochre wanting to granulate, but the paper isn’t letting it flow, it’s sucking it in.